This is a very rare and hard to find miniature folding pocket knife, with bird design in handle. This is a good looking knife, and decent quality for being China made. Mini Folding Knife. Model: Mini knife. This is a great little Seki, Japan made knife with gold tone textured brass handle. It is a nice small size to fit in a pocket or purse without taking up much room. This is a rare and discontinued item. Gold Flake Series. 3.63" closed. Gold synthetic handle. Nickel silver bolster(s). Inlay shield. Yes, we combine orders! Why Buy From Us?. The handle is celluloid and looks great. Model: Bulldog folding knife. Buck 108 Machete Leather Sheath. We want your experience with ePrague to be pleasant and worry-free! Blade: Carbon Steel; original factory edge. 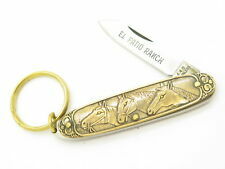 This is a great Seki made El Patio Ranch knife with brass handles featuring horse scene, made circa 1980s. Model: Parker El Patio Ranch. El Patio Ranch. "I've wanted this knife for years and it is a great addition to my buck collection. Presented is a favorite amongGreat Eastern Cutlery fans. New in tube, it's the collectibleNorthfield UN-X-LD #441218 Buffalo Jack featuring a mirror polished Clip Point blade, and a Spear Point blade. Hi! Welcome to Weaim2pleez. 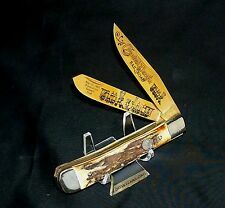 Here is a Rough Rider RR1414 Gold Flake Trapper Knife. Measures 4 1/8" (10.5 cm) closed with 440 stainless clip and spey blades. Gold flake celluloid handles with grooved nickel silver bolsters and inlay shield. "Gold Pan It Dig It Find It" etch on clip blade. "Strike It Rich" etch on spey blade. Item #rr1424. BRAND NEW in box! BUY IT NOW!! . Crowing Rooster. 3.5" closed. Gold resin handle. Nickel silver bolster(s). Inlay shield. We Combine orders! It is a nice small size to fit in a pocket or purse without taking up much room. This is a rare and discontinued item. Made circa 1990s, by Kai, Kawakami, or other high quality maker. Slim Pocket Sized Knife. Crowing Rooster. 4.13" closed. Mirror finish stainless clip and spey blades. Gold resin handle. Nickel silver bolster(s). Inlay shield. We Combine orders! Gold Flake Series. 3.63" closed. Stainless spear and pen blades. Gold synthetic handle. Nickel silver bolster(s). Inlay shield. Yes, we combine orders! Why Buy From Us?. Steel Warrior. 4.13" closed. Mirror finish stainless clip and spey blades. Gold abalone handle. Nickel silver bolster(s). Inlay shield. Bone handle knives are made with cow bone. We Combine orders! Hi! Welcome to Weaim2pleez. 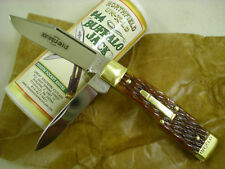 Here is a Rough Rider RR1521 Gold Flake Canoe Knife. Measures 3.625" (9.2 cm) closed with stainless standard edge spear and pen blades. Gold flake synthetic handles with inlay shield. Nickel silver bolsters. Mirror polish finish blade. Item #rr1521. BRAND NEW in box! BUY IT NOW before someone else grabs it!! . Gold Flake Trapper - 4 1/8" closed. 440 stainless clip and spey blades. Gold flake celluloid handles with grooved nickel silver bolsters and inlay shield. "Gold Pan It Dig It Find It" etch on clip blade. E.C. Simmons. 3.88" closed. Gold resin handle. Nickel silver bolster(s). Inlay shield. Bone handle knives are made with cow bone. Yes, we combine orders! I am here to earn your trust and provide you with a product you can rely on. You are buying one (1) Franklin Mint Knightstone Collections Knife and Collector's Carrying Case! No longer in production, this folding knife has a highly detailed handle cast in Nickel and Gold in the shape of a dragon with simulated ruby eyes. 4.13" closed. Mirror finish stainless clip and spey blades. Nickel silver bolster(s). Blade etching. Gift boxed. Yes, we combine orders! Mcusta creates custom quality production knives that are hand finished. Machine Custom = Mcusta. This is Mcusta's higonokami friction folder. It is not a locking blade, but the pressure of the thumb on the blade back prevents it from closing in use. CROWING ROOSTER CALIFORNIA GOLD RESIN HANDLE STOCKMAN, FOLDING POCKET KNIFE California Gold Resin. Crowing Rooster Shield. Nickel Silver Pins, Bolsters and Liners. High Polish Backsprings. High Quality German Stainless Steel Blade. 2.75" Blades. 4" Closed Pocket Knife. New In Box. Gold Flake Series. 3.25" closed. Stainless clip and pen blades. Gold synthetic handle. Bone handle knives are made with cow bone. Nickel silver bolster(s). Inlay shield. Yes, we combine orders! Other Info: Large and small pen blades. Wolf artwork on handles. Closed: 2.75"; Blade: Stainless with standard edge and mirror polish finish; Handle: Brass;. Yes, we combine orders! Why Buy From Us?. Strike it rich with this new series of Rough Rider pocket knives. The Rough Rider Canoe with Gold Flake Acrylic Handle and 440A Stainless Steel Blades. Embellished 440A stainless steel blades. Gold flake acrylic handle. Barrel Mounts. New Case Cutlery 3" closed. Stainless long clip blade. Sapphire Glow (gold, blue, green and white) Corelon handles with nickel silver bolsters and inlay shield. Master blade features series etch. CROWING ROOSTER CALIFORNIA GOLD RESIN HANDLE TOOTHPICK FOLDING POCKET KNIFE California Gold Resin. Crowing Rooster Shield. Nickel Silver Pins, Bolsters and Liners. High Polish Backsprings. High Quality German Stainless Steel Blade. 2.25" Blade. 3" Closed Pocket Knife. New In Box. May 10, 1869 ~ 1969. MAY 10, 1869. PROMONTORY SUMMIT, UTAH. FINAL GOLDEN SPIKE. JOINED WITH A FINAL GOLDEN SPIKE. " LIMITED EDITION ". 24 Karat Gold Plated. 24 KARAT GOLD PLATED BLADES. The clip blade has a "NORTHFIELD UN-X-LD MADE IN U.S.A." front tang stamp with a "GREAT EASTERN CUTLERY TITUSVILLE, PA" rear tang stamp. The secondary pen blade features a "441218" pattern stamp on front and a "CARBON" stamp on the rear. Hi! Welcome to Weaim2pleez. Here is a Rough Rider RR1518 Gold Flake Stockman Knife. Measures 3.625" (9.2 cm) closed with standard edge stainless clip, spey and sheepsfoot blades. Gold flake synthetic handles with inlay shield. Nickel silver bolsters. Mirror polish finish blade. Item #rr1518. BRAND NEW in box! BUY IT NOW before someone else grabs it!! . Gold Flake Series. 3" closed. Stainless long clip blade. Gold synthetic handle. Nickel silver bolster(s). Inlay shield. Yes, we combine orders! Why Buy From Us?. Crowing Rooster. 3" closed. Mirror finish stainless long clip blade. Gold resin handle. Nickel silver bolster(s). Inlay shield. Bone handle knives are made with cow bone. Yes, we combine orders! Other Info: Large and small pen blades. Wolf artwork on handles. Blade: Stainless l Standard Edge l Mirror Polish Finish. Handles: Brass. Size: 2.75" closed. We Provide Free Local Pick Up on all orders. 3.25" closed. Stainless clip blade. Gold synthetic handle. Inlay shield. Yes, we combine orders! Why Buy From Us?. 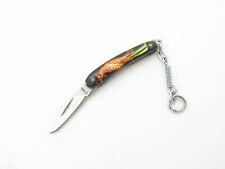 New Case Cutlery Mini Trapper 3 1/2" closed. Stainless clip and spey blades. 24 Karat Gold Corelon (gold and black swirl) handles with nickel silver bolsters and inlay shield. You can expect our service to be friendly and professional. CROWING ROOSTER CALIFORNIA GOLD RESIN HANDLE WHITTLER, FOLDING POCKET KNIFE California Gold Resin. Crowing Rooster Shield. Nickel Silver Pins, Bolsters and Liners. High Polish Backsprings. High Quality German Stainless Steel Blade. 2.75" Blades. 4" Closed Pocket Knife. New In Box. E. C. Simmons. 4" closed. Mirror finish stainless spear, pen, and coping blades. Gold resin handle. Nickel silver bolster(s). Inlay shield. Bone handle knives are made with cow bone. Yes, we combine orders! Stainless c. Stainless clip and spey blades. 24kt gold Corelon handles with nickel silver bolsters and inlay shield. We Provide Free Local Pick Up on all orders. Ending Soon. KnifeGuy78 >. Orders must be Prepaid before Pickup. Case Cutlery Small Toothpick Knife 910096SG 3" closed. Stainless long clip blade. Stainless long clip blade. Sapphire Glow (gold, blue, green and white) Corelon handles with nickel silver bolsters and inlay shield. 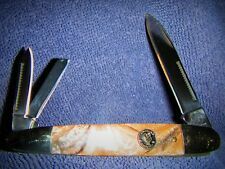 Case Cutlery Knives 4 1/8" closed. Stainless clip and spey blades. 24kt gold Cor. 24kt gold Corelon handles with nickel silver bolsters and inlay shield. MPN: CA925424KT. 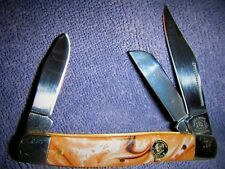 Case Cutlery Mini Trapper Knife 920724KT 3 1/2" closed. Stainless clip and spey. Stainless clip and spey blades. 24 Karat Gold Corelon (gold and black swirl) handles with nickel silver bolsters and inlay shield. Rough Rider Gold Flake Trapper Knife RR1424 4" closed. 440 stainless clip and spey blades. Gold flake celluloid handles with grooved nickel silver bolsters and inlay shield. We Provide Free Local Pick Up on all orders.